This afternoon I’ve been working on this project today, this is actually the back of the quilt. I’ve been experimenting with different fabrics and I used Osnaberg. The background fabric on the top of the quilt is linen, and I think the two work well together. Osnaberg, fabric, named for the city of Osnabrück (from which it may have been first imported into English-speaking countries). Originally made from flax yarns, it has been made from either flax, tow or jute yarns, sometimes flax or tow warp with mixed or jute weft, and often entirely of jute. The finer and better qualities form a kind of common sheeting, and the various kinds may contain from 20 to 36 threads per inch and 10 to 15 picks per inch. I’ve used the pattern on the top fabric as the guide for the quilting and then added a small fill in designs. 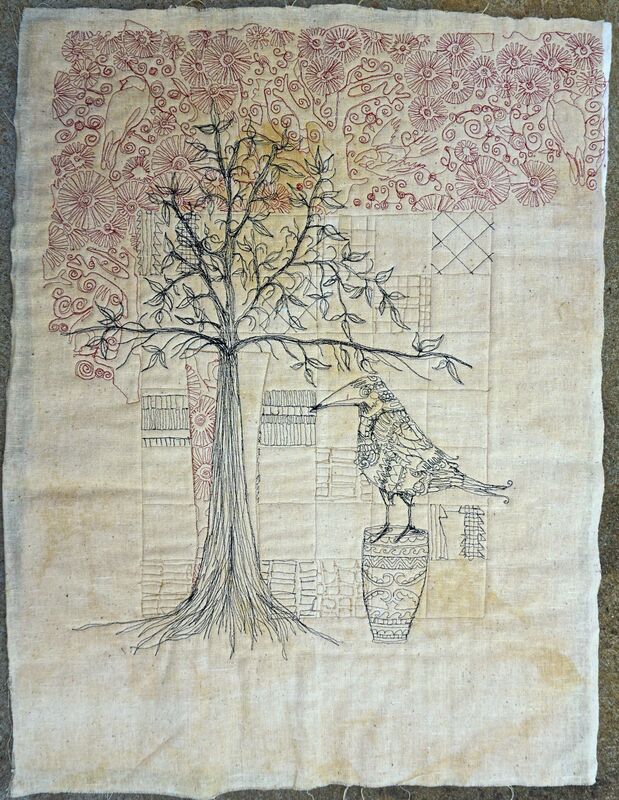 Its all been quilted on the sweet 16 which gives it a whimsical sketched effect. My great joy today was to work on my Bayeux quilt. It took just a short time to get back into the rhythm. I have a formula to work to and its so different to everything else I do. I will tell you that I know how many hours I’ve worked, how much thread I’ve used, how many needles and bobbins used and filled. Unlike anything else I do I’ve had to learn so many different genres. I have reference books all over the house, in the car and on my desk. Every spare minute, (even when I’m cooking) I study. 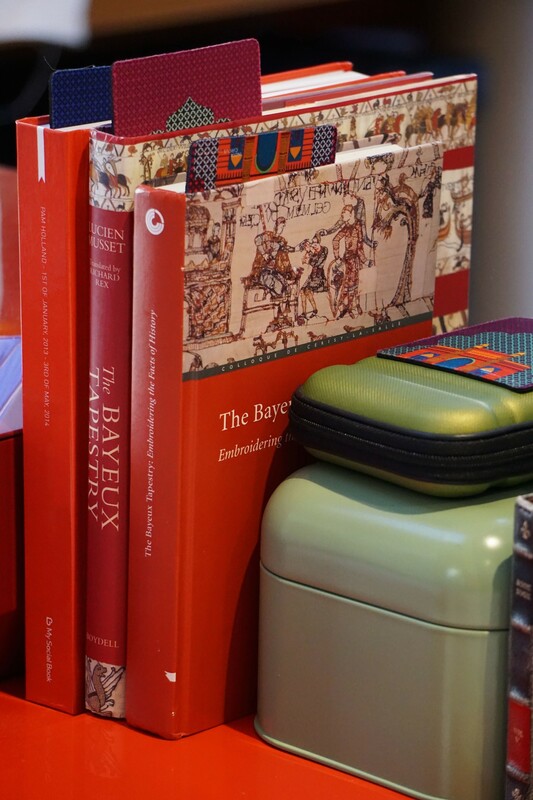 For instance, today I followed how the embroidery yarn was made, the dyes on the original tapestry have been analysed by the ITF and the colors identified against the Methuen Handbook of Colors. Then again its hard to decide just who to follow through this journey, there are a number of differing views on the technical study side. I’ve not quite made my 4.00 am starting time yet… maybe tomorrow. !! Tagged with: Creating a quilt. Just love to hear what you are working on. You are such an inspiration to me. So happy that you are back to work on your beloved Bayeux! Osnaburg fabric has a very interesting history. Yes, it started where you said but then manufacturers in Scotland copied the fabric and not being German speakers kind of kept the name. They produced millions of yards of this fabric which was sold to make clothing for the slaves on the plantations in America and the West Indies. After the abolition of slavery their business fell off. Today we use cotton as an everyday item and forget that back then cotton was regarded as a luxury fabric and linen was the cheap fabric . Times change.